Espa Waterdrive 22 Pressure Control - 2.4 bar starting pressure - Discontinued. 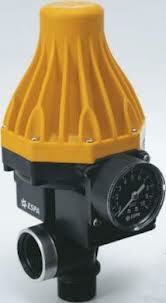 Assembled on a pump for automatic water supply and reduce the water hammer. Free of maintenance without preload of air. Quiet running operation. Non return valve built-in, pressure gauge, pressure switch and electronic control with dry running function integrated and manual reset button. Please click here for a technical data sheet.